Bayon is considered one of the "big three" sites that every visitor to Angkor should see - the other two being Angkor Wat and Ta Prohm. - Photo credit: @nihaoira (Instagram). 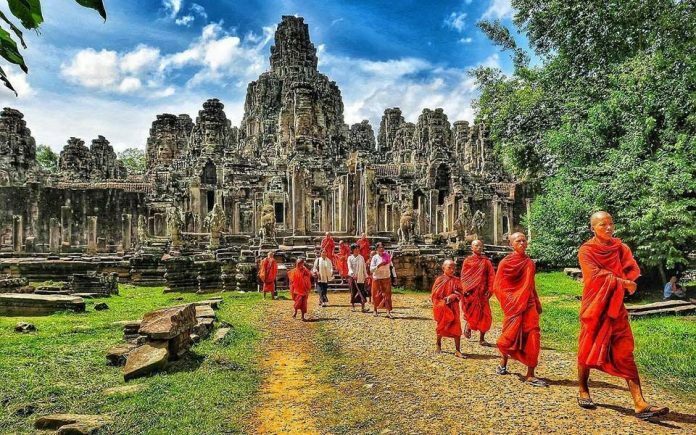 Several centuries before Leonardo DaVinci created the enigmatic smile of his Mona Lisa, hundreds of serene faces displaying equally enigmatic smiles were carved into the famous temple now known as Bayon. Bayon is in the heart of the ancient city of Angkor Thom, which was the symbolic center of the Khmer empire. Dedicated to Buddha by King Jayavarman VII, this state temple was originally called “Jayagiri” (which means “Victory Mountain”) but was renamed “Banyan Temple” sometime after the period of French occupancy. The Buddha is said to have attained enlightenment after a long period of meditation beneath a banyan tree. The religious significance of the banyan tree and the many banyan trees growing around the site made it an appropriate name. However, the local Khmer who worked on the restoration of the temple were responsible for its final name change. The workers mispronounced the name as “Bayon” instead of “Banyan” and the name stuck. 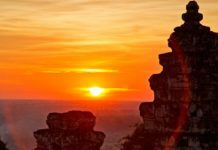 The tranquil stone faces of Bayon are some of the most recognizable images from the Angkor Archeological Park, and missing the opportunity to see them in person would be an absolute crime. In fact, Bayon is considered one of the “big three” sites that every visitor to Angkor should see – the other two being Angkor Wat and Ta Prohm. In addition to the multitude of giant stone faces smiling down at you from every direction, the site also includes an impressive array of well-preserved bas-relief carvings depicting an unusual combination of scenes from history, mythology, and everyday life. 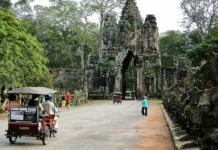 Although Bayon is fairly compact compared to many of the other temples, you should allow at least two hours to wander through its complex maze of chambers, passages, and occasionally steep stairways. There is sufficient shade in Bayon to make it pleasant to visit at any time of day, but if you wish to avoid the crowds you should visit in the afternoon. There are unique photo opportunities everywhere you turn, and a guide can help point out where to get the best shots – including the popular composition of visitors facing “nose to nose” with one of the giant heads. 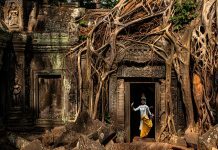 The play of light changes dramatically throughout the day due to the complex structure of the temple and the shade from the surrounding trees. There is almost no direct sunlight in the hours just after sunrise and just before sunset. Bayon is located in the exact center of the Angkor Thom complex, precisely 1.5km from both the North and South gates, and can be entered from any point. Unlike many of the other Angkor temples, Bayon has no moats or surrounding walls. 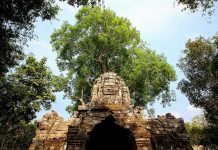 It is protected on all sides by the city of Angkor Thom itself. Part of the Small Circuit, Bayon is easily reached from any direction as it is surrounded by a road. 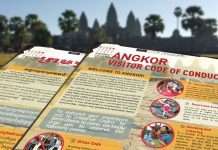 Contact us to arrange for a safe and reliable tuk-tuk or taxi driver to show you around the park. The architectural style of Bayon is distinctly different from Angkor Wat and other temples in the Angkor complex and it has undergone numerous modifications and additions during its history. Unlike the magnificent façade of Angkor Wat, Bayon doesn’t look terribly impressive from a distance. You can’t fully appreciate its beauty until you enter the temple. Most of the Angkor temples are constructed with features oriented in the four cardinal directions, but Bayon’s face towers seem to point every which way. While most of the towers do have four faces, some have only two or three, while the central tower has many more. The number of face towers is seemingly random, and there is some dispute about how many towers were included in the original design of the temple. Some believe there were 49, and others say it was 54. 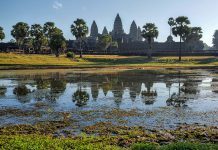 One theory holds that there was one tower for each of the 54 provinces in the Khmer empire at the time of the temple’s construction, symbolically keeping watch over all the inhabitants of the kingdom. However, the ravages of time have left only 37 of the towers standing today. There are two richly decorated galleries which serve as enclosures to the temple – the outer gallery depicting scenes from battles and other historical events as well as images of everyday domestic life, and the inner gallery primarily illustrating mythological tales. The beautiful bas-relief carvings feature an astonishing level of detail, including more than 11,000 figures. The inner gallery, added by the Hindu King Jayavarman VIII, is elevated above ground level, and the upper terrace, which holds over 200 of the famous giant faces, is one level higher. A circular central tower rises 43m high. Bayon was the last state temple built in the Angkor complex. The great Buddhist ruler, King Jayavarman VII, began its construction near the end of his life – sometime in the late 12th or early 13th century. 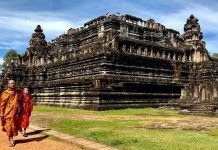 Originally intended to be a Mahayana Buddhist temple, it was altered during the reign of King Jayavarman VIII when the empire briefly reverted back to Hinduism in the mid-13th century. The temple underwent further modifications under the Theravada Buddhist kings in later years. 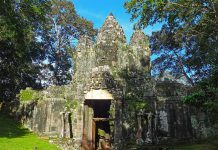 The most distinctive feature of Bayon is the subject of some disagreement among historians. Some believe that the tranquil faces are meant to represent the Bodhisattva of compassion known as Lokesvara, and in fact, the host of tranquil visages is often referred to as the “200 faces of Lokesvara”. Others believe that the faces are portraits of King Jayavarman VII, and indeed, they do bear a striking similarity to other statues of the king. 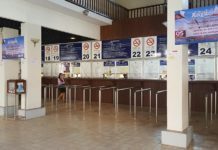 Both hypotheses may be true, as many Khmer rulers regarded themselves as “god-kings”.